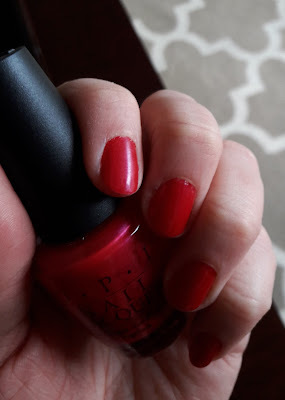 I have a second update on my No Spend February for you today. If you missed my first update, you may find it here. 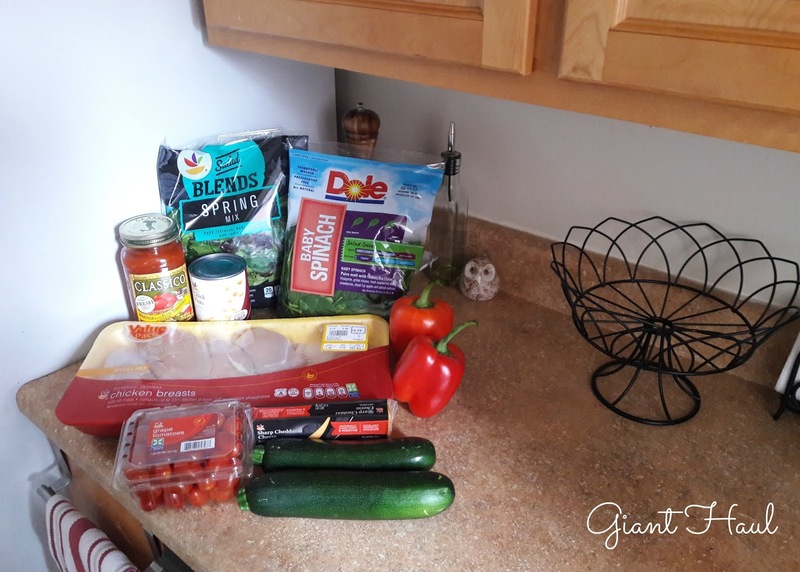 Like my first check in, I will share how it's going, list what I ate lately, my meal plan, and my grocery haul. I must confess that I busted my No Spend Month. With a single purchase though. 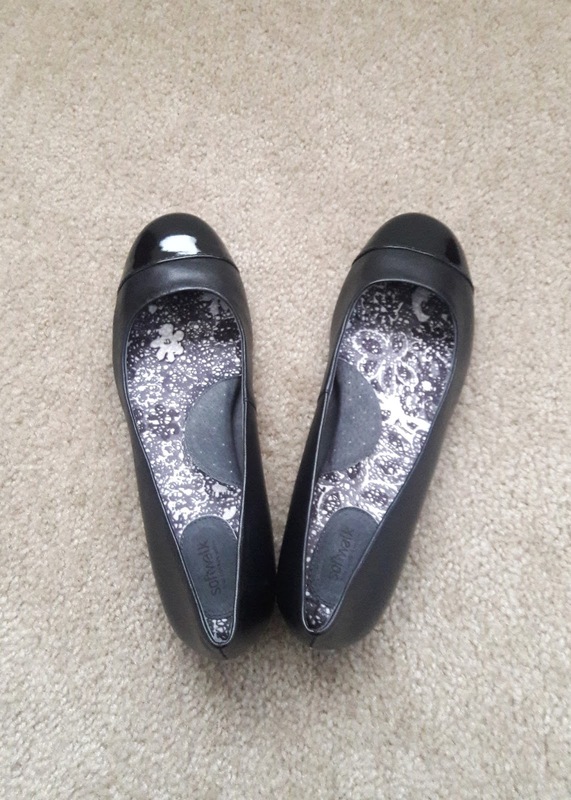 I replaced my black ballet flats intended primarily for work. I ordered them on Amazon for $98.75 on Thursday and with free two-day Prime shipping, they arrived via USPS on Saturday. I always order the same ones since they work so well. I found them online once and have been repeatedly buying them ever since. 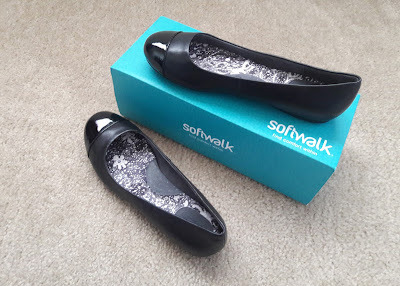 From a brand called Softwalk, the Napa Ballet Flat is incredibly comfortable all day with significant padding. A good shoe, they also feature texture on the bottom of the sole. I love that such a comfy flat is also stylish. They are black leather with a patent black toe cap. They are sleek and even with my long toes, do not show any toe "cleavage." I adore them. They are so me. I walk so much that they only last six to seven months. My last pair was over seven months old. They really should have been an exception in my personal No Spend Month, but I thought I could stretch it, possibly make my casual flat black chelsea boots or my black leather pointed flats without any padding whatsoever work and then order my work flats on March 1st. I didn't want to not dress appropriately or be in pain though. They were incredibly shabby looking, plus falling apart. In fact, the sole was pulling away from the front of the shoe. Krazy glue didn't work. I am an individual who prides herself on her professionalism and these were far too unprofessional. I couldn't take it. I am a bit disappointed since I am a woman of my word. 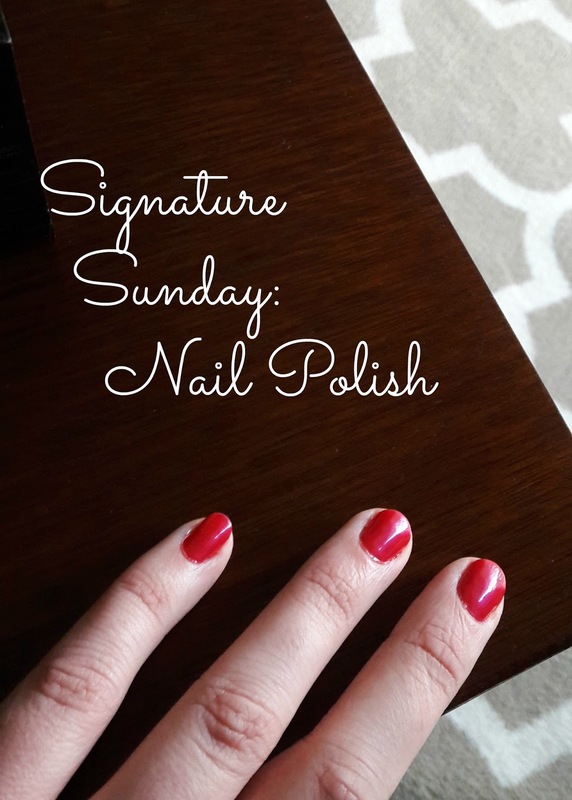 Plus, I realize that I am sharing my challenge publicly. But, I also know that this single purchase won't make me buy more and I do love my new shoes. I might not have purchased them if I wasn't pretty sure that I would meet my savings goal for the challenge. I already have well over that amount in my checking account now and only plan to spend $5 more on groceries (more on that later in this post) and possibly $5 on laundry (if I don't have enough on my laundry card and if I don't do laundry at my parents' place) between now and the end of the month. I assure you that I remain committed to not spending. If I meet my savings goal, do not spend any more money on anything that is not an established exception, and learn life lessons, then I will still consider my No Spend Month a success. I am ready for this challenge to be over. I still want what I want. Not looking at those desired items online much anymore, they still remain in my thoughts. I am also deleting emails regarding Presidents' Day weekend sales before even opening them. No, I don't care if it's the "LAST DAY" to save. There will always be sales. Speaking of being online, I have been watching a lot of YouTube lately. Sometimes, this particular distraction doesn't help curb my temptation to spend though since I may view YouTuber's haul and her video makes me really want to hit the Target Dollar Spot or the Dollar Tree. When you live alone, you prepare something for dinner and often have leftovers. Of course, variety is the spice of life, but I am glad to be a person who can happily eat the same thing over and over! I know that some of my meals this week did not include vegetables, but I was on a strict budget and for the most part, my meals are rich in vegetables. Those are not in order, but I just wanted to know if I have enough food. I write a shopping list and make sure I have it in store. 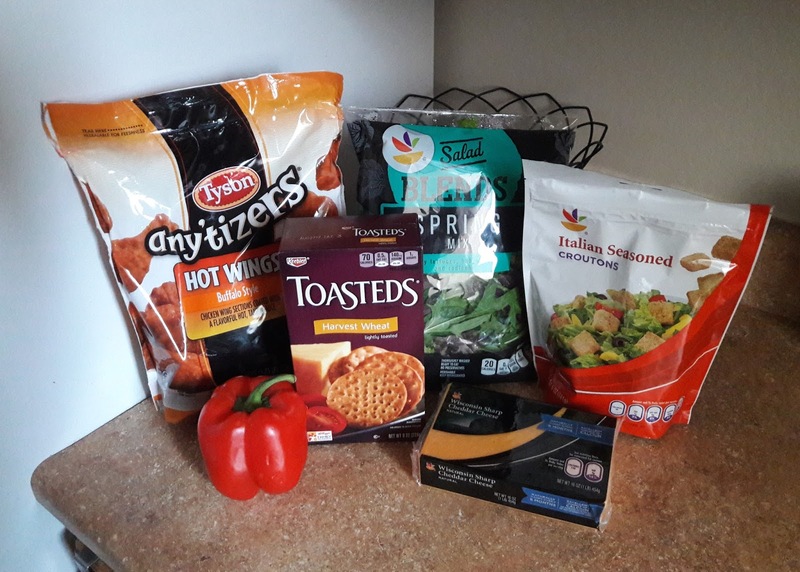 I purchased: store brand thin pretzels, Betty Crocker Wild Blueberry Muffin Mix, Lavazza ground espresso, Simple Orange Calcium & Vitamin D Pulp Free orange juice, Keebler Harvest Wheat Toasteds crackers, store brand Italian Seasoned croutons, 1 lb. deli Rotisserie Chicken Salad, Vienna sliced white bread from the bakery, store brand Self-Rising Crust pepperoni pizza, store brand Spring Mix salad, King size Hershey's Special Dark chocolate bar, and 8 oz. store brand Sharp Cheddar Cheese. I am out of the peanuts I usually grab at Target, so I wanted a snack item and the pretzels will be a side for my sandwiches this week. I selected the store brand bag of pretzels since it was cheaper than the name brands. I wanted a change from a cranberry muffin for breakfast, so I picked up a box of blueberry muffin mix. It wasn't on sale, but I didn't need to buy milk to make them. I baked them yesterday and ate my first one this morning. I needed espresso and the Lavazza was on sale for $5.59 and is always much cheaper than my preferred Illy brand, so I buy Lavazza in the wintertime. I saw that Simply Orange was on sale for $3 in the circular and I wanted to buy orange juice anyway. The crackers were not on sale, but I was out and wanted them. Same thing with the croutons, not on sale, but I was running very low. I discovered that the deli's Rotisserie Chicken Salad was on sale in the circular and since I only grab it every once in awhile, I decided to get one pound which will make four nice-sized sandwiches. This chicken salad is not fancy, but basic and good. I cut the mayo taste a bit by sprinkling it with celery salt. For the sandwiches, the store didn't have the sliced Italian bread I liked in front of the deli counter, so I picked up another similar sliced white loaf from the bakery section next door. I might not have bought this loaf if I saw its $4.49 price though, opting for a $1-$2 loaf in the bread aisle instead. I missed having pizza on Friday night the past couple of weeks, so I definitely picked up the store brand I discovered on sale for $3.50 in the circular. I prefer the DiGiorno brand, but think the store brand is similar to that rather than like the Red Baron kind that tastes cheap and reminds me of what they served in a school cafeteria. I earned $0.25 cash back on the frozen pizza in my Ibotta app. 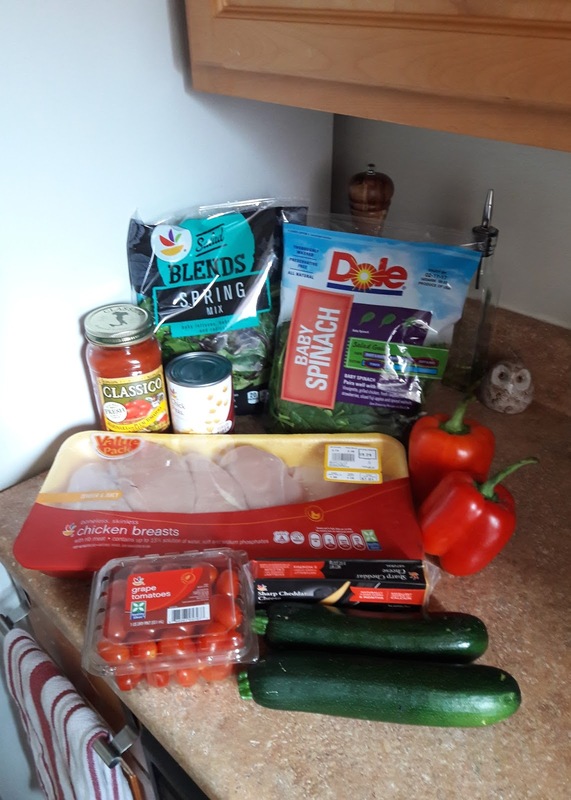 I also found the salad on sale for $2 in the circular and since I am trying to lose weight and hit my goal weight of 150 lbs., I decided to pick up a bag for three healthy meals. In the circular, I saw that King size Hershey's bars were on sale for $1 and wondered if the Special Dark variety was on sale. It was, but for $1.67. I still added it to my basket to have as my chocolate for like 2-3 days. Finishing it up on Monday after lunch, the bar only lasted 2 1/2 days. I failed to buy enough new chocolate for the week, but maybe I can bake something out of mixes and/or ingredients in my pantry and cabinets. (Since I am also running low on cupcake liners, I may not bake my signature brookies, but brownies would be fantastic...) I always pick up cheddar cheese and I saw that the 8 oz. chunk was on sale for $2 in the weekly circular. For these 12 items, I spent $39.64, way over my $25.00 weekly budget. I figured since there were only 11 days left in the month, I could basically look at this haul as feeding me for the last week and a half of the month rather than a 7-day week. Out of my $100 grocery budget for the month, I have spent $93.32 so far. Since I have $6.68 left, next weekend, I could buy a bag of salad and a chunk of cheddar (likely totaling around $5) to hold me over until March begins. 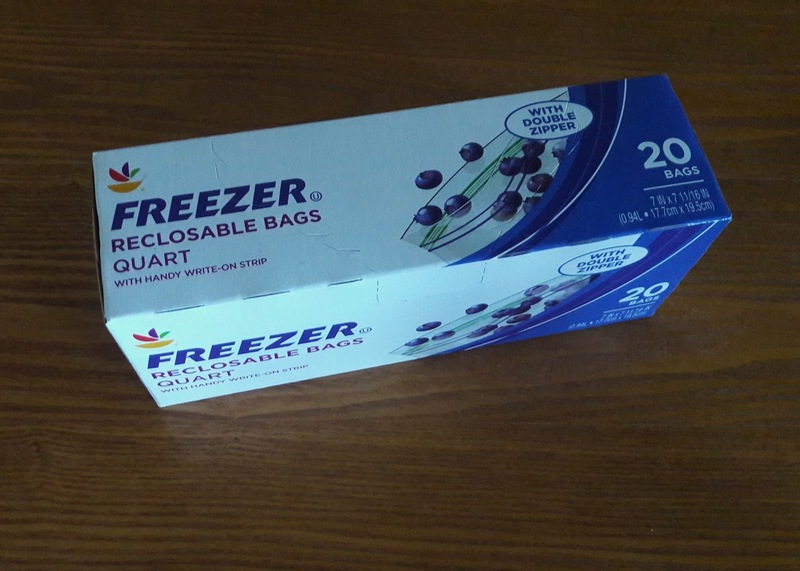 In a separate transaction at self-checkout, I paid for a box of freezer bags out of my $21.00 in cash, an exception in my No Spend Month. This store brand product totaled $2.11. Now, I have $9.36 left for spending money for the rest of the month. I have already used these bags to at least freeze most of the blueberry muffins I baked Sunday morning. If you are doing No Spend February, how are you coming along? Or have you decided to do No Spend March? If so, I am incredibly impressed with you tackling a 31-day month because a 28-day month was difficult for me! And how are you preparing? I hope you find my experience helpful. The weather was wonderful today. It was sunny and a high of 70 degrees (F). I got outside and enjoyed it twice. After lunch, I took a short stroll through a nearby neighborhood. In a black and white striped long sleeve tee, blue jeans, and black ballet flats (without a winter coat and scarf in February! ), I walked up the road for ten minutes until the timer on my phone went off and then I turned around and walked back for another ten minutes. I figure walking twenty minutes is one mile. Even though there weren't any flowers yet, the stroll on the sidewalk through a single family home neighborhood was lovely in the sunshine under blue skies and the perfect temperature nonetheless. I should have worn sunglasses though! Not only was this something to do for fun, I appreciated the exercise as well because I am trying to lose weight and hit my goal weight of 150 pounds. On a day like today, you couldn't keep me away from my balcony! I decided to have my near daily wine, cheese, and crackers sitting at my little table around 5 o'clock. 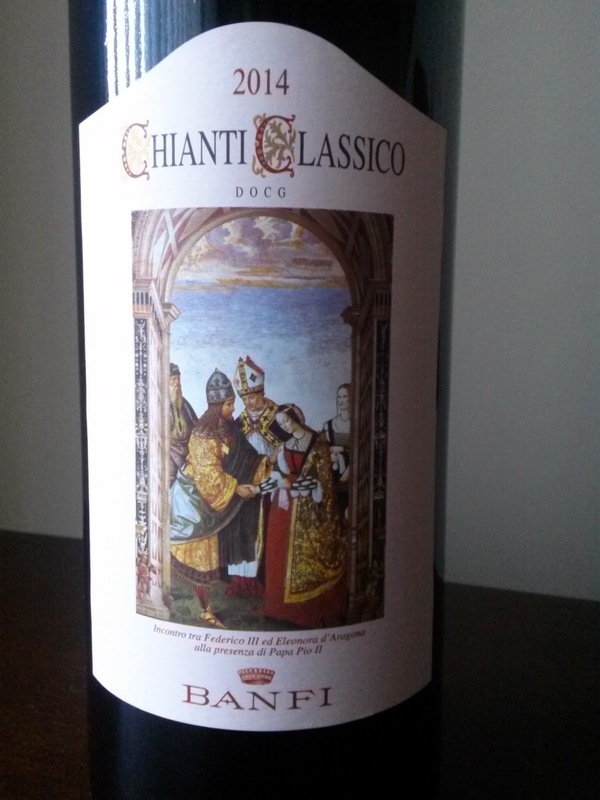 This afternoon, I poured myself less than a glass of this wine and arranged a bit of antipasti to go with it, just a few slices of sharp cheddar cheese and a half dozen Toasteds Harvest Wheat crackers. 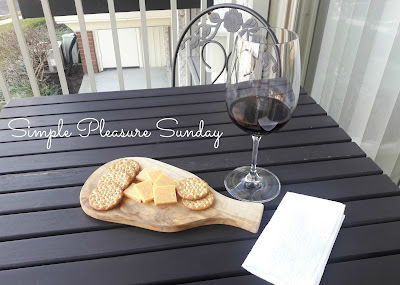 Both the glass and olivewood cheese board are from one of my favorite stores Crate & Barrel. Those food choices are not so Italian, but I like them. The tradition of a social event surrounding a pre-dinner cocktail or glass of wine along with snacks is called an aperitivo in Italy. One of the popular cocktails for this occasion is a Spritz or any other drink than contains a bitter like Aperol. The cheeses would be Italian like fresh mozzarella. Italians have many rules regarding digestion and an aperitivo is thought to "open" the stomach. Italians eat dinner later than Americans do, so a bar may start serving aperitivo at 7. This concept is similar to happy hour in the US, different since a discount is important here and may also start earlier at 5. 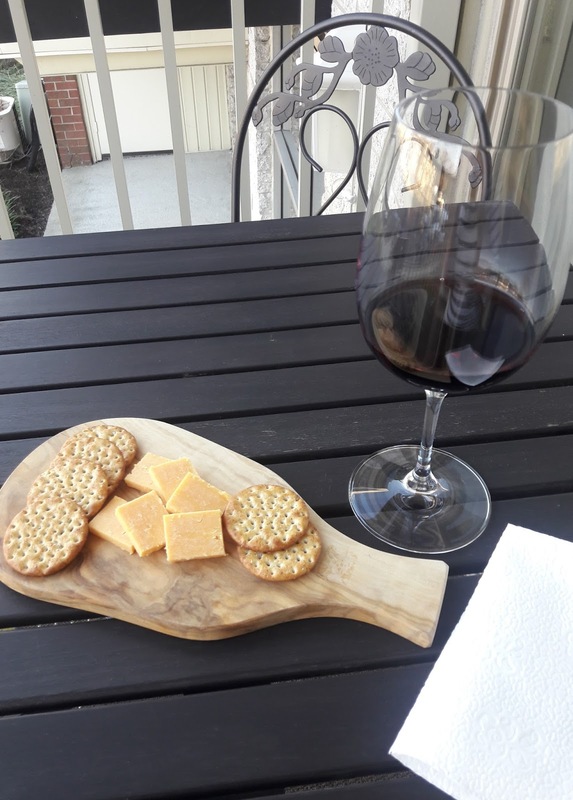 So, I had an Americanized aperitivo al fresco. I quite enjoyed it. I sipped and snacked while viewing a few short YouTube videos on my phone. I look forward to spring and quality time spent on my balcony. This is my first "check in" during my first No Spend Month. I wanted to report how it's going. 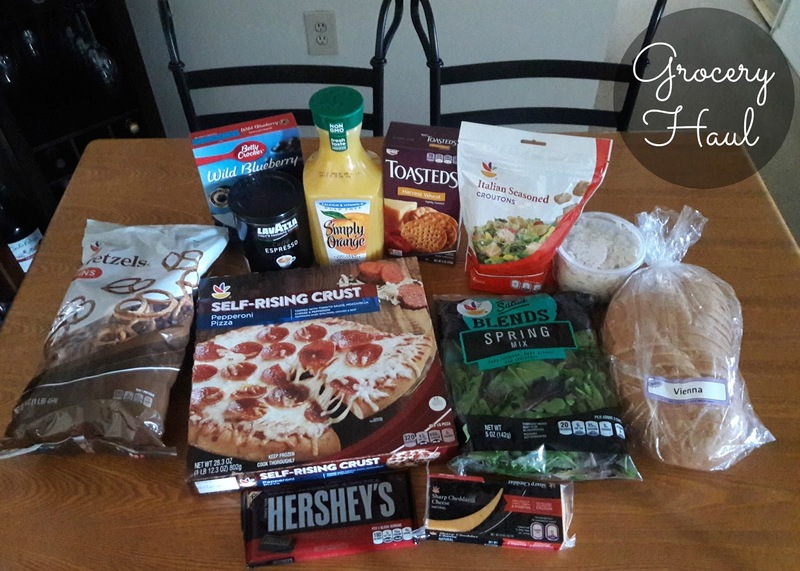 I will also feature grocery hauls, a few notes on how I meal plan, and list what I ate since the 1st of the month. I have not spent any of my money that is not already an established exception. I do find this challenge difficult, but I feel like I can do this for a short period of time. A week in, the novelty of it wore off, my temptation to spend increased. I felt like it had been awhile since I last treated myself and I wanted to acquire the things from wishlist that I have on my phone. Items for the home usually top the list. February 3rd was a payday Friday and I usually order a thing or two (or three) online when I receive my paycheck. That particular morning, I distracted myself with a delicious breakfast. I also paid my bills, busying myself before my shift started. In general, I have been staying off retail websites. I got sick last Wednesday the 8th. I had felt off overnight, so I kept worrying about possibly letting someone down. I "woke up" definitely sick. I don't often call out of work, but did pretty early, knowing I was too sick to go in. Suddenly, I had a sore throat and a high fever with minor cough, runny nose, nausea, and muscle aches. I felt like I had tonsillitis, which I had every winter when I was growing up, but haven't had in years. I arranged to go to Patient First and arrived around 8:45 that morning. I was shocked when I was diagnosed Influenza A. I had gotten a flu shot after all. The doctor told me that she sees many who have had the vaccine with the flu. It was the first time that had happened to me; I've gotten the flu shot for like 20 years now. The one year I didn't, I got the flu. That was in 2005 when there was a shortage and I did not belong to a high risk group. I got it at the end of February, right before my study abroad experience in Italy. From that flu, I remember the severe fever and chills thing where you are both hot and cold and cannot decide if you want to get under the covers or throw them off. This flu, that was particularly annoying between midnight and 2 AM one night. This time, I googled why and kept clicking search results until I fully understood the reason. Anyway, the severe body aches, feeling like I had been hit by a bus, characteristic of the flu, didn't start until about 10:30 that morning. 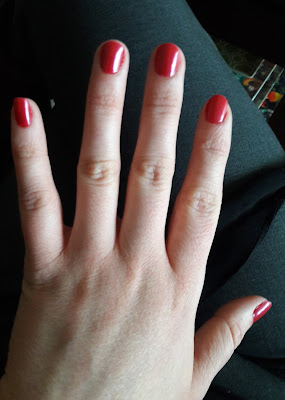 My mom helped me on Tuesday morning and I took good care of myself for days. As a result, I feel much better now. I apologize for the lack of updates on this challenge, but I was truly down and out for a few days last week. I was both sick and probably groggy from medicine. Being so sick was good for No Spend February! When I was sick, I wasn't out at stores shopping. Instead, I was in bed, trying to sleep, but too uncomfortable to do so. When I was feeling better, I lounged on the sofa, you know, for a change of scenery... I did think, "I should rent a movie" once, especially since my external disk drive didn't want to play any of my DVDs the past two times I've tried, but I quickly reminded myself that I couldn't spend money. There is so much fantastic free content out there anyway! I watched YouTube videos and a season of an Amazon Original series that was included with my Prime membership (that I will likely reveal in an upcoming Simple Pleasure Sunday blog post). Although, the lovely ladies I follow on YouTube tend to be budget-friendly and actually added to my temptation to spend by making me want to go to the Dollar Tree for organizational bins badly! Do It on a Dime, especially! But also other YouTubers such as Love Meg. I don't even usually patronize dollar stores! It's also not like I have so many spaces I need bins for... Anyway, luckily, my prescription for Tamiflu was only $10 and an approved exception. Also for medicine, my mom gave me an opened box of DayQuil (which was barely touched, but all the NyQuil was gone. Nonetheless, I am very grateful. I took every one of those capsules!). So, that was free. I had Tylenol in stock. My mother also gave me a container of frozen homemade soup as well as a twenty dollar bill and absolutely insisted that I use it when I was headed for the pharmacy. (I listed my purchases in my last post. Again, I am grateful.) I haven't been charged a copay or anything from the urgent care center I patronized yet, if there even is one after my insurance coverage. I am starting to run out of a few items that I would like to replace, but am okay with either making something else work and/or waiting to repurchase. 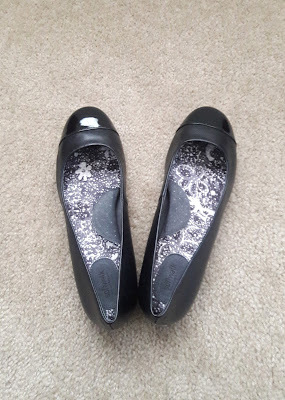 There is one thing, however, I am seriously considering busting my No Spend Month challenge for and that is replacing my black supportive ballet flats I wear to work. They look very shabby from being so worn, stretched out, faded, have several thin spots that may become holes, and are actually falling apart. In fact, one of the soles is coming apart from the shoe in the front. I dug out my ancient Krazy glue from the bottom of my walk-in closet and tried to dispense any sticky stuff into the opening under the toe. I normally buy the same pair over and over for work (and sometimes for play) since I love their style and comfort. I should replace them every six months when they're past their prime, but must every seven months. February 10th would be 7 full months. I walk so often that I tend to wear through shoes fairly quickly. They are $95-$99 and I can usually order on Amazon with free two-day Prime shipping. I may order them out of professionalism. I may be able to wait a couple of more weeks, until March 1st, so I can "be good" for my personal challenge. I do take it seriously. Next, I have a few "grocery hauls." Can you tell that I've been watching a lot of YouTube lately? 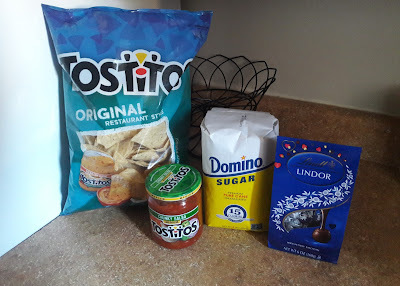 From left to right: Tostitos tortilla chips, Tostitos medium chunky salsa, Domino sugar, and Lindt Lindor dark chocolate truffles. I wanted chips and salsa for the Superbowl Sunday football game. Usually, on sale, they're $3 a pop, but this time, I paid $2.24 for each. 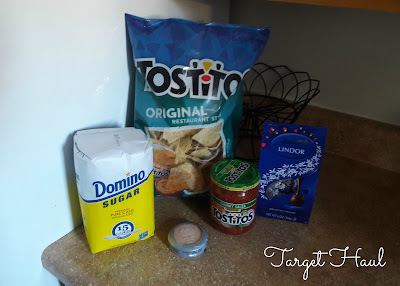 The chips were on sale and both had a 25% off Cartwheel (app) discount. I needed sugar and actually poured this bag into my glass jar yesterday. The sugar was not on sale. Even with a Cartwheel discount, the store brand (Market Pantry) sugar would have been 8 cents more expensive than the name brand. Sometimes, the generic is not cheaper. These chocolate truffles are my favorite! So decadent and delicious. I finally ran out of the chocolates I had around for the holiday season. They were out of these in the regular candy section, so I went to the Valentine's Day aisles. For the same product only with several hearts on the top of the bag, I added a 25% off Cartwheel offer on Valentine's Day candy to my list on my phone while standing in the aisle and scored the bag for $3. Usually, I like buying them when they're on sale for $4. My total for these four items was $10.05. With such good discounts, it's like I got the sugar for free. I love the Cartwheel app. I haven't been on it lately though since I will not return to Target until March and I don't want to be tempted by a good deal to break my one-visit rule. There will always be sales. I rang up the other item separately. One of my exceptions was to have $21 in cash that I could spend. 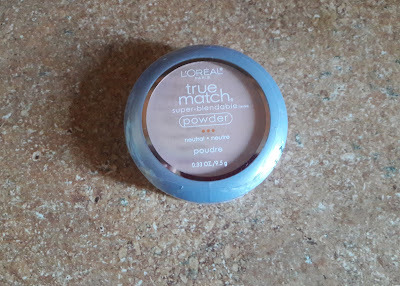 I spent $9.53 on a beauty product I was low on, my powder. After this purchase, I have $11.47 left to spend this month. This is true match super-blendable powder by L'Oréal Paris in classic ivory of the neutral line, specifically n2. It's a good product and I love it. Having ran out this morning, I will start using my new one tomorrow. Back row, from left to right: Tyson any'tizers Buffalo Style Hot Wings, Giant Spring Mix salad, and Giant Italian Seasoned croutons. Front row, from left to right: red bell pepper, Keebler Toasteds crackers in Harvest Wheat, and a 16 oz. block of Wisconsin Sharp Cheddar Cheese. I wanted wings and pizza to feast upon while I watched the game and commercials for the Superbowl. I just had pizza for dinner on Friday and Saturday and conscious of my budget, I decided to just go with wings. Keeping costs low, instead of having them delivered, I picked up a bag of prepared wings in the freezer section at the grocery store. This was the cheapest bag, on sale for $5.99. They were good and I would buy them again. Spring Mix is my favorite kind of bagged lettuces. I like dark greens and radicchio. The bag was $2.50, $2 or $2.50 is usually the sale price I pay. I can eat three large salads or four medium from a bag. I love these seasoned croutons! My salad would not be complete with them! They are $1.19 and were not on sale. My favorite vegetable is the red bell pepper. 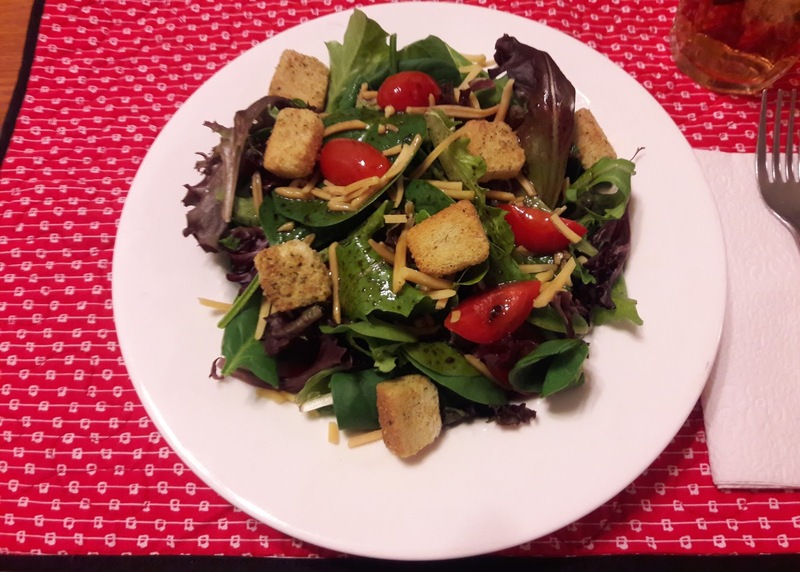 I love it in salad, especially during the winter (when tomatoes are not the best). I'm sure this one had four bumps at the bottom, which means it is female and sweeter, perfect for eating raw in salads. 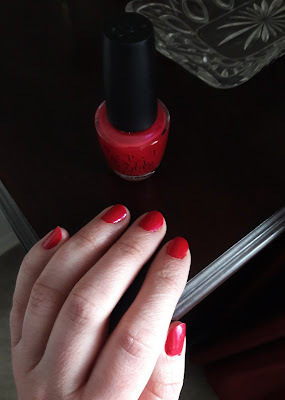 It was on sale for $1. My favorite crackers are Harvest Wheat Toasteds. They pair well with cheddar and parmesan. I scored them on sale for $2.50. I always flip through the pages of the circular online before heading to the store and I learned that the 16 oz. chunk of cheddar was on sale for $3. Since I have to have cheddar every week, I usually buy the 8 oz. block for $2.79, not on sale. Regularly priced at $5.49 and only a little bit more than the cheese half its size, that was a good deal on this trip. I prefer the store brand cheddar to many of the name brand varieties. This block lasted me the entire week. In total, I spent $16.18. $10.05 at Target and $16.18 at Giant is $26.23 spent in groceries for the week. This is a bit over my $25 budget, but since the last week of February is only three days, I think I can still come in under $100 for the month. My groceries include: Classico tomato sauce in the Marinara with Plum Tomatoes & Olive Oil variety, Giant chickpeas, Giant Spring Mix salad, Dole Baby Spinach, two red bell peppers, a Value Pack of five large boneless skinless chicken breasts, Giant grape tomatoes, 8 oz. Giant Sharp Cheddar Cheese, and two zucchini. This kind of tomato sauce is my favorite. It's a light sauce of high quality. I am willing to pay $2.49 since it makes any of my cheap pasta meals so delicious. I tend to grab three of them whenever it's on sale for $2. Chickpeas are a source of fiber and protein and I sneak then into my pasta specialty for nutritional value. This can was on sale for 50 cents. I usually buy this salad each week. In the spring, summer, and fall, I might buy two. I wanted to buy two bags of spinach, but at $2.99, it wasn't on sale, so I ended up with one. I used the bag as one of my sides for a balsamic chicken meal. The other was intended for my pasta specialty. 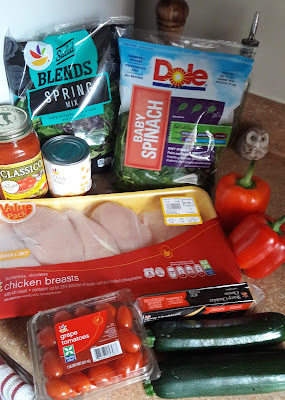 I have a little bit of sauteed spinach leftover; that might go into my pasta specialty... One of the red bell peppers features three bumps on the bottom, meaning it is male, with characteristics better suited for cooking. The other with four bumps is female and sweeter, perfect for eating raw. The male will go into my pasta specialty and the female will go into my salads. These two vegetables cost $3.98 together. In menu planning for the week, I look at the online circular to see what's on sale. This time, I saw that chicken was on sale for $1.88/lb. In store, I picked up a value pack of 3.73 lb. for $7.01. I didn't see any store brand boneless skinless chicken breasts in a smaller package. Using this recipe, I prepared balsamic chicken with two of the chicken breasts last night. 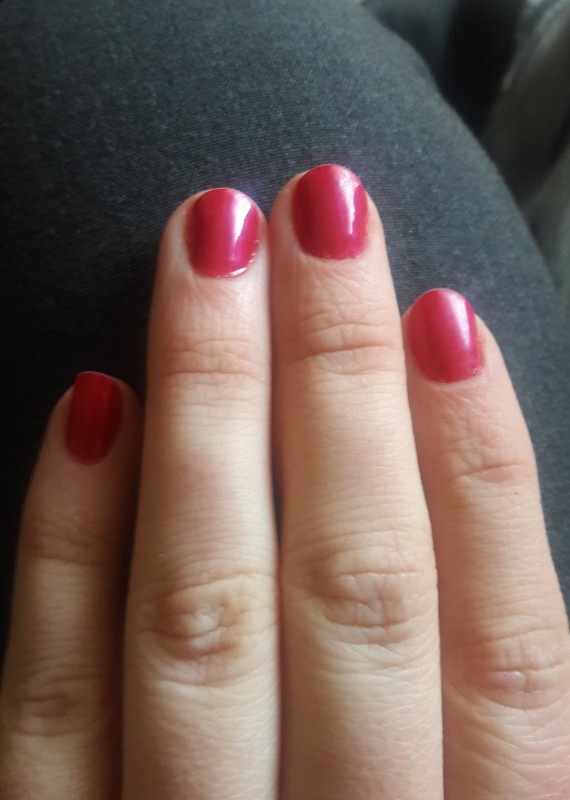 They turned out well. Delicious. The other three are stored in the freezer. I will use the grape tomatoes for many things. They go in salads, my pasta specialty, and pesto pasta. I also like to eat them with cheese and crackers. The pint was $2.50. I can't go without my sharp cheddar cheese! The chunk was $2.79. I usually pick up a couple of zucchini every week. The two were $2.69 together. 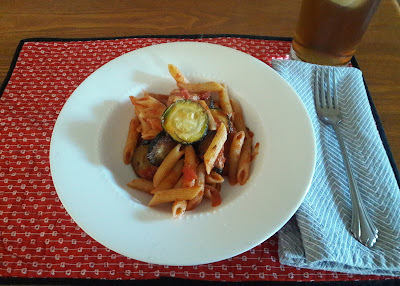 I made penne pasta with sauteed sliced zucchini in tomato sauce for lunch today and have leftovers for another meal this week. 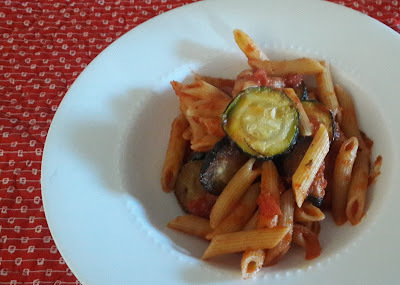 I developed a fondness for zucchini during my study abroad experience in Italy. I felt like the produce was expensive this week. My total was $27.45. This is over the $25 budget and a bit more than I wanted to spend, but I must be kind to myself. Still sick and with my dad waiting for me, I wasn't nearly as diligent with adding up the numbers in my head, on my list, or in my phone's calculator app. I know what $25-$30 worth of food looks like since that's what I tend to spend each week. I even know what a shopping list with with that budget looks like, about 10-13 items. 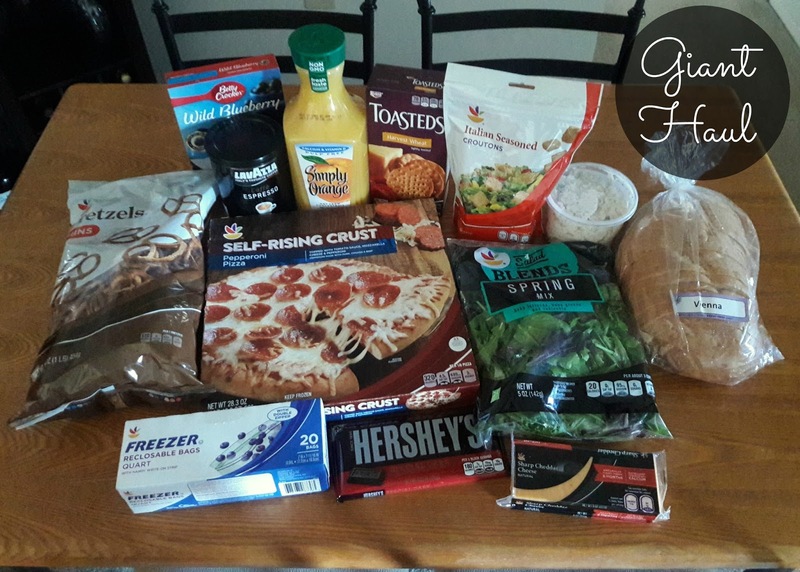 My totals for the first two full weeks of grocery shopping amount to $53.68. That means I have $46.32 left in the budget. I can definitely stick with that. 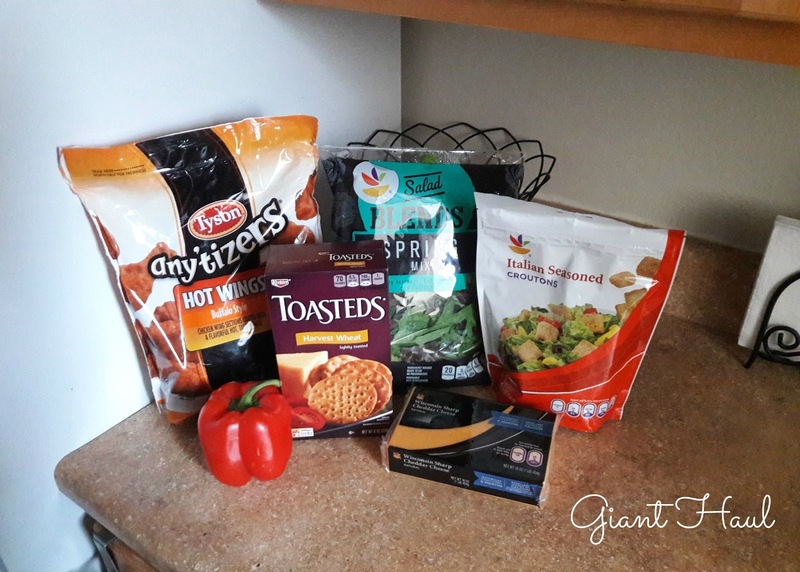 I wanted to briefly share how I meal plan. First, I look at the grocery store's online circular to see what ingredients are on sale. Next, with those cheap meal ideas in mind, I write down what the meals I want to have that week. I don't tend to assign a meal each night, but I do have a general idea. For example, I tend to cook something on Monday, maybe Sunday, sometimes both of these weekend days of mine, and know what I'm cooking those particular days. Lately, it is traditional for me to have pizza on Friday, when I have it at home. Since I enjoy entertaining, I may invite a friend over for dinner one weeknight. I could also fill out "This Week's Dinners" box in my planner, but that's only Monday through Friday. If not, I definitely fill it in with what I ate. I had a menu planning memo pad on the side of my refrigerator and should get into the habit of using it. Anyway, after planning, I look in my fridge, freezer, cabinets, and pantry and see what I have already. Then, I add needed items to my shopping list. I may click on a recipe saved on my Pinterest board to see if I have all the ingredients in stock or on the list. I stick to my list closely in the store. 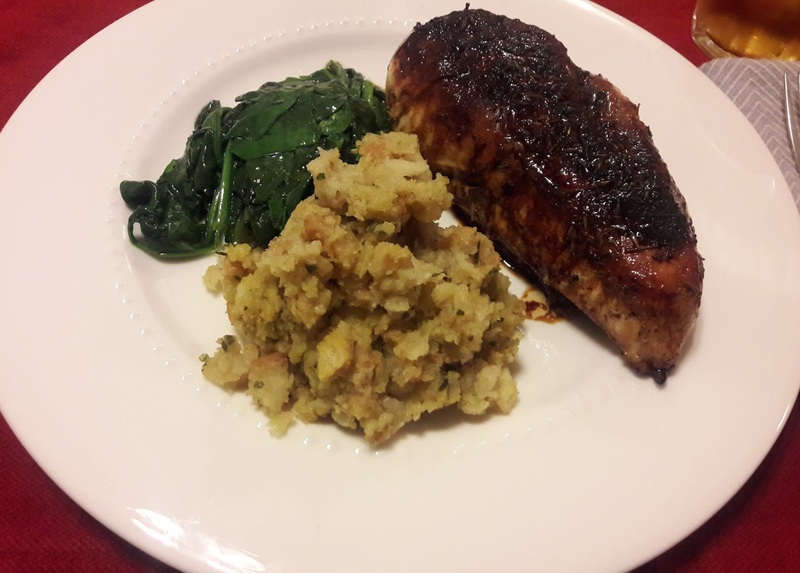 Since I am not incredibly detailed in my meal planning in this blog post, I thought that I would share what I ate. 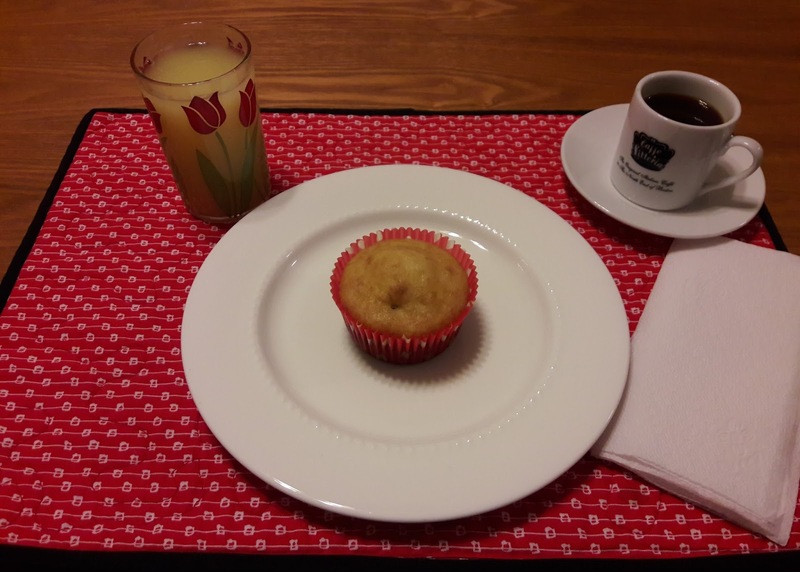 I often tend to enjoy the same breakfast: a cranberry muffin with espresso and orange juice. On Sunday the 5th, I had baked the muffins from the Pillsbury box mix. (This is one of the very few times I am not loyal to Betty Crocker. Please don't tell Betty!) The majority go into my freezer and I take one out at a time for the next day. Every once in a while, I treat myself to a pain au chocolat, one of my chocolate croissants from Williams-Sonoma. Delicious. 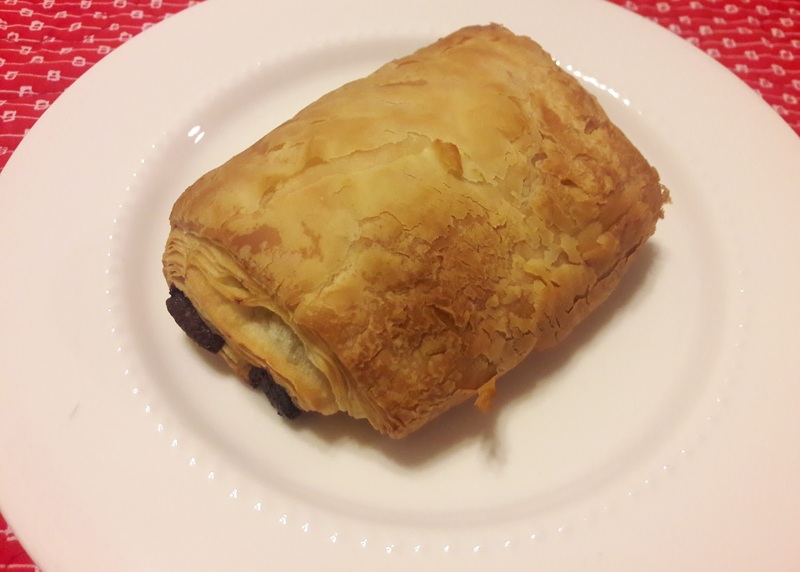 In an effort to distract myself from buying anything before work on a payday Friday (the 3rd), I baked and enjoyed this simple pleasure for breakfast. 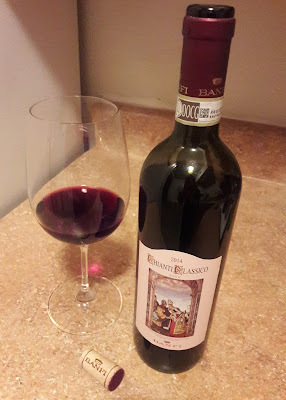 As a reward for taking good care of myself for three tough days with the flu, I savored another one this past Saturday morning. 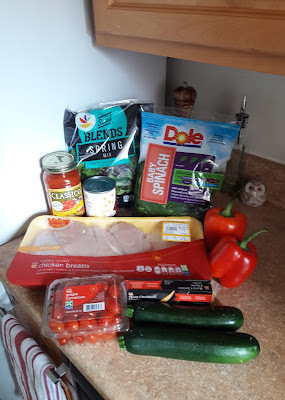 As usual, salad and pasta make up most of my meals, with a Friday pizza night and a few other meals thrown in for some variety. However, both salad and pasta are incredibly versatile! You can change up the ingredients so that you never have the same meal twice if you don't want to! Salad and pasta are also cheap choices. You can get a box of pasta for a $1, often less, and then with a 1/2 cup dry pasta serving size, the box feeds you many times. Both salad and pasta can be meatless, which saves money. If needed, I can put a slice of bacon or two in salad. In addition, I might buy those Perdue chicken Short Cuts to top my pasta specialty, but haven't in a while. I may do so since I recently unlocked a deal on them with my Ibotta cash back app (but I might not as it expires soon). I love vegetables so much that I don't have to have meat. There are alternatives to meat as well. Chickpeas, for example, add protein to a salad or pasta dish. I tend to use them in my pasta specialty. I usually make my vegetable-rich pasta specialty either every week or every other week. Protein-rich beans are much more economical than meat. I truly love carbs, even my salad gets croutons. Like I said, I am a vegetable lover; I don't eat a lot of fruit. I am a picky eater. I do not think I eat in a very healthy way, especially with all the carbs around, but I have come a long way and am always improving. 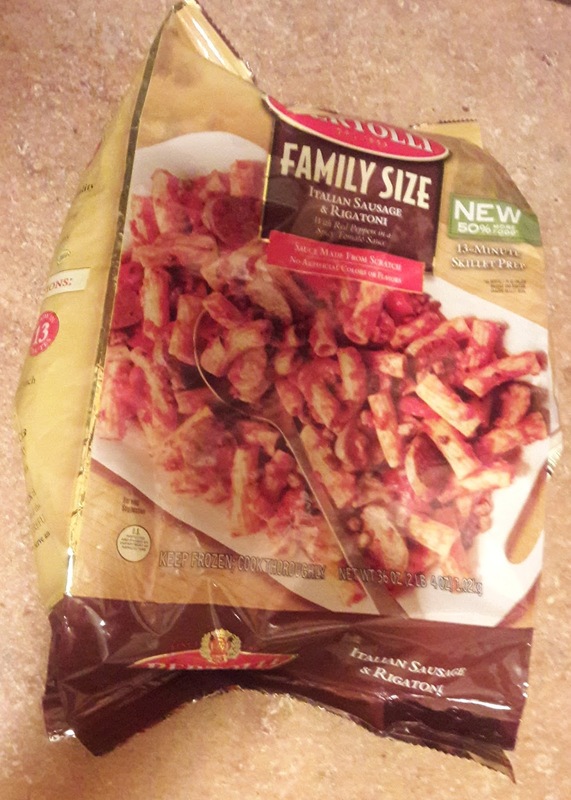 That family size Bertolli pasta meal has been sitting in the back of my freezer forever! I didn't spontaneously host a dinner party of four, even though my parents were redoing their kitchen. This big bag yielded four meals. 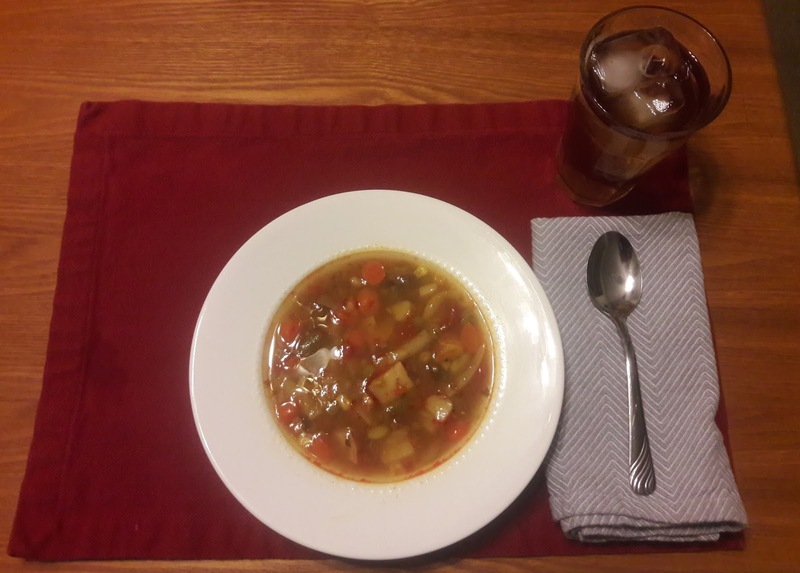 I hardly ever eat soup, but I do adore my dad's homemade beef vegetable. Plus, I was very sick with the flu and wanted all the fluids I could possibly take. Usually, I also prepare my Italian pork chops every once in awhile. I tend to buy pork at Target where I am no longer shopping for the rest of the month, so we'll see if I make them this month. A month feels like a long time without them! So far, my No Spend Month is going well. It is difficult, but I'm sticking with it. Only 15 full days to go! I am glad I picked the shortest month! 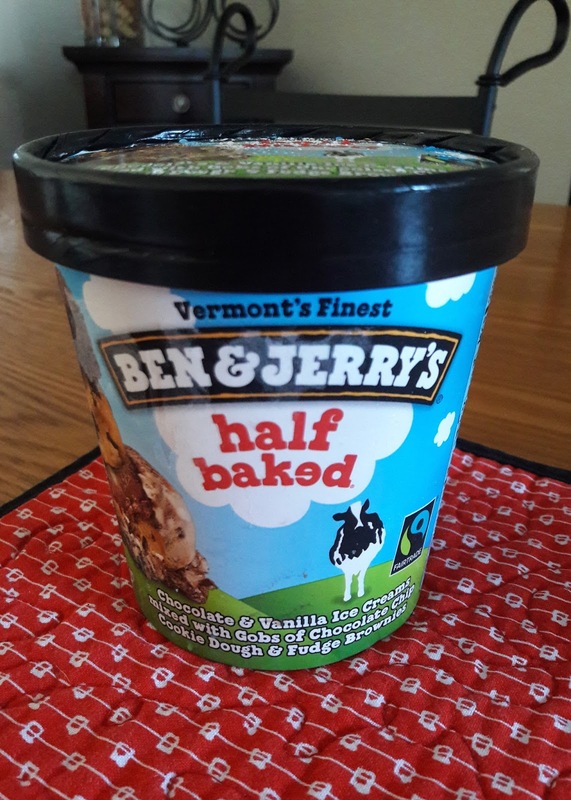 My favorite ice cream is Ben & Jerry's Half Baked Ice Cream. It is a combination of chocolate chip cookie dough (so vanilla ice cream with spheres of chocolate chip cookie dough) and chocolate fudge brownie (meaning chocolate ice cream with pieces of brownie batter) ice creams. I'm sure this comes as no surprise since brookies are my signature dessert to make. This ice cream is available in stores by the pint. 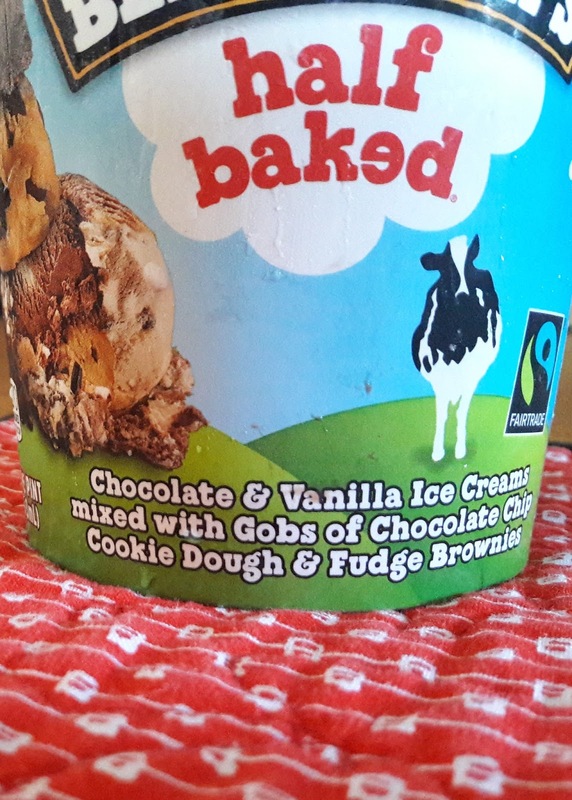 Half Baked is decadent and delicious. This brand does it well. 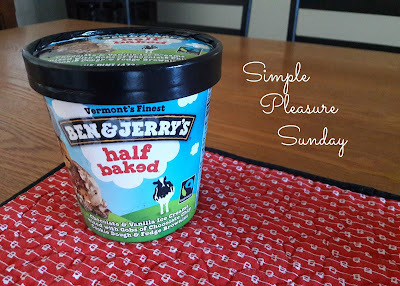 I have tried this concept from one from the Target brands, but I didn't love it since it didn't include a lot of the pieces of dough and batter. I really love the Ben & Jerry's product. 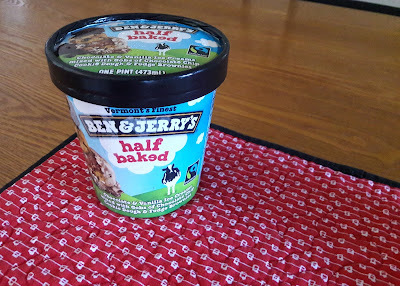 An occasional treat, I only buy it every once in a while. 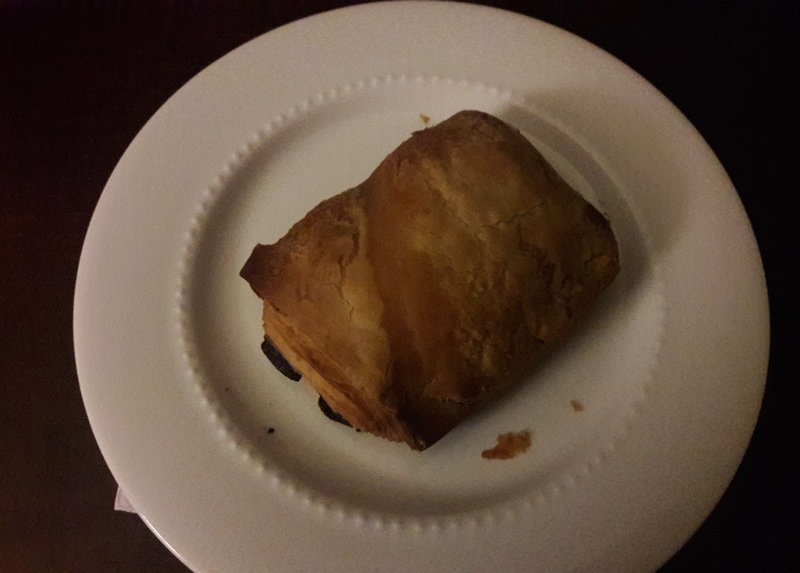 I bought it on sale at the end of January, but saved it to eat during the first week of February, a small way to sheer myself up during my difficult No Spend Month challenge. 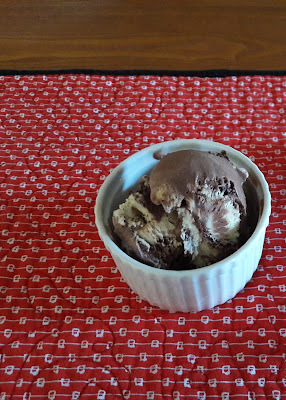 I was going to take pictures for this blog post, but sometimes, this frozen treat loaded with all its goodness doesn't scoop well enough for its closeup. Wednesday morning, I was diagnosed with the flu (despite having had a flu shot, I still got Influenza A) and when I was picking up my prescription of Tamiflu at my local grocery store's pharmacy, my mom gave some money and insisted that I buy what I both wanted and needed. 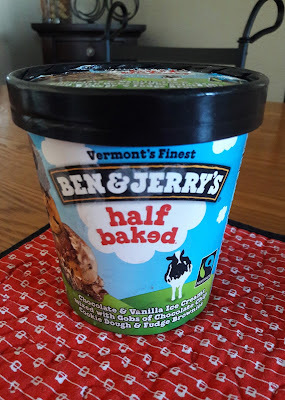 I purchased three cans of chicken rotini soup, a small box of tissues, a 2 liter bottle of caffeine-free coke, a loaf of bread, and a pint of Ben & Jerry's Half Baked ice cream. After my severe symptoms subsided and I started to feel better, I savored my ice cream. It was a nice treat after a not so nice couple of days. 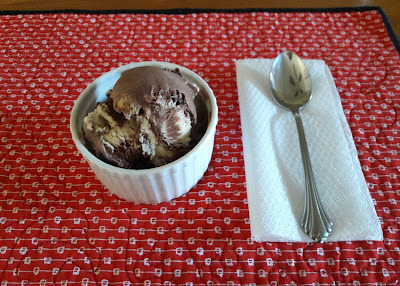 I like to serve it in a small ramekin from Crate & Barrel. 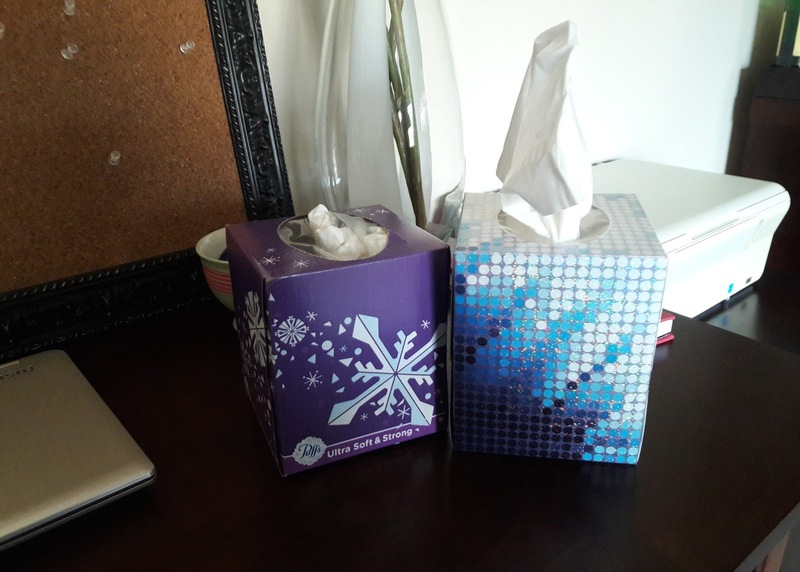 P.S.- Inspired by something Fiona said in her book Financially Chic, I bought a box of tissues to have at home in January. When they ran out at the end of the month, I kept the empty box. I thought if I was sick, I had heard that you could put your used tissues in there, then they wouldn't be all over if a trash can wasn't nearby. As a minimalist, I usually don't save things "just in case." Plus, I was always ill as a kid, but rarely am as an adult. When the flu shockingly hit me, I was so glad I kept this box as a used tissue receptable on my nightstand those first two tough days. So convenient. I wanted to share this idea with you and snapped a picture of the boxes on my desk right before I pitched the purple box into the trash. Today is Day 5 of the saga and I feel so much better. I'm not back to normal yet, but I plan to dive into blogging tomorrow. I want to publish posts on my No Spend Month this week. Thank you for your patience. Stay tuned!